Over night, a 1909 T206 Honus Wagner baseball card sold for nearly $1.25 million. The online auction, which was conducted by Goodwin & Co, finished with 14 bids and fell within estimates that suggested it would go for between $1 million and $1.5 million. This particular T206 Honus Wagner has a Sweet Corporal back and is graded SGC 40 Very Good. The official closing bid for the Wagner card was $1,232,466.34. According to Joe Holleman of St. Louis Today, the card is headed to New Jersey. The buyer wishes to remain anonymous at this time. The Goodwin & Co. auction saw another huge sale with a 1909 T206 Eddie Plank reaching $330,825.95. The card is graded SGC 70 and is the best known Plank to have the "Piedmont 150 Subjects" back. 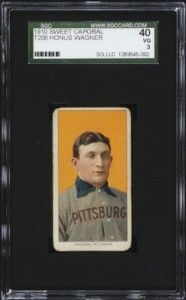 The 1909 T206 Honus Wagner is considered to be the benchmark against which all other trading cards are measured. Considered to be extremely rare, the legend behind it has further fueled its value and prestige. Pulled from production, some suggest Wagner was taking a stance against smoking as the card was distributed with tobacco products. Others say Wagner simply wanted to get paid more. The card's legendary status was further raised when Wayne Gretzky and former Los Angeles Kings owner, Bruce McNall, bought one at the height of the baseball card boom in the early 1990s. That same card has changed hands several times since. Ken Kendricks, the Arizona Diamondbacks managing general partner, bought the card for a record $2.8 million. You can read an in-depth history on the 1909 T206 Honus Wagner here.